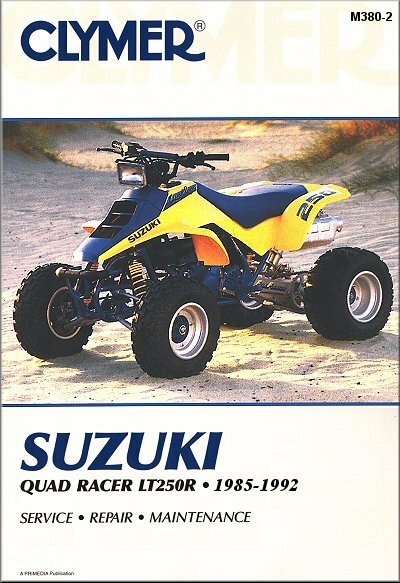 Suzuki QuadRacer LT250R ATV Repair Manual 1985-1992 is available for only $26.95 from TheMotorBookstore.com. Largest selection of Clymer, Chilton, Haynes, Bentley and Seloc repair manuals at discount prices. Please note this is the Manual for the LT-250R, not just the LT-250, there is a difference between the two. If you are unsure, check the frame for the ID plate, or your registration paperwork, to find out which one you have. You can also use our Free ATV VIN decoder, to make sure before you place your order. Remember to take your Suzuki ATV repair guide when you ride. It will easily fit in your gearbag, toolbox, or glove box. Not the Suzuki Repair Manual you need?